For 100 years, the New Mexico Museum of Art has served a catalyst and showcase for creativity and the enjoyment of art. Within the museum and through its outreach activities, artists, learners and community members are empowered to think critically and see a multiplicity of meanings. Join us beginning November 25, 2017, for an entire year of celebration as we continue to bring the art of the world to New Mexico and the art of New Mexico to the world. 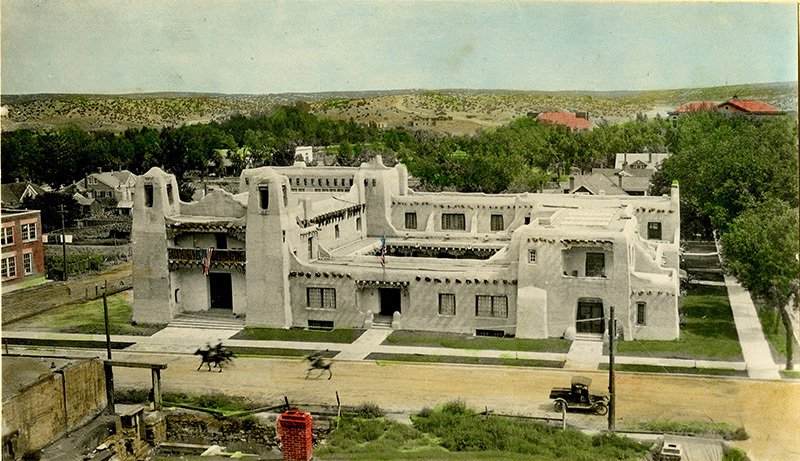 In commemoration of the 100th anniversary of our historic first day, as well as the century since, the Museum will host a free, day-long birthday event for all ages from 10:00 a.m. to 5:00 p.m. in the Museum, on the surrounding streets, as well as on the historic Santa Fe Plaza. New Mexico’s artistic past, present and future converge during 2017 as the New Mexico Museum of Art celebrates its 100-year anniversary. Visitors can participate in art making activities including the making of an Artrageous birthday hat, birthday card or decorate paper 100 year eyewear. Visitors who come in 1917-1920s costumes win a prize. Meet costumed interpreters dressed as artists from the past who will be roaming the galleries and talking about artwork on view. Characters will include artists Georgia O’Keeffe, Laura Gilpin, Will Shuster, and a few surprise guests. On the streets around the Museum, check out Axle Contemporary mobile gallery, the Wonders on Wheels mobile museum, vintage cars, lowriders and more. Hear about works of art, recent acquisitions and new installations on tours with Museum curators. Meet the museum curators for a brief introduction to each exhibition. 11:00 am Shiners Club Band performs a Tableau Vivant and playing early 20th century jazz. 3:00 pm Local dignitaries give a tribute to the Museum of Art and wish us a Happy 100th birthday. 3:30 pm Cake will be served outside of the Museum. Free parking is available at both the City Convention Center and the PERA parking lot at 1120 Paseo de Peralta. The PERA parking lot will have a free shuttle to the Museum every fifteen minutes from 10:00 am to 5:00 pm. The New Mexico Museum of Art is a Division of the New Mexico Department of Cultural Affairs.